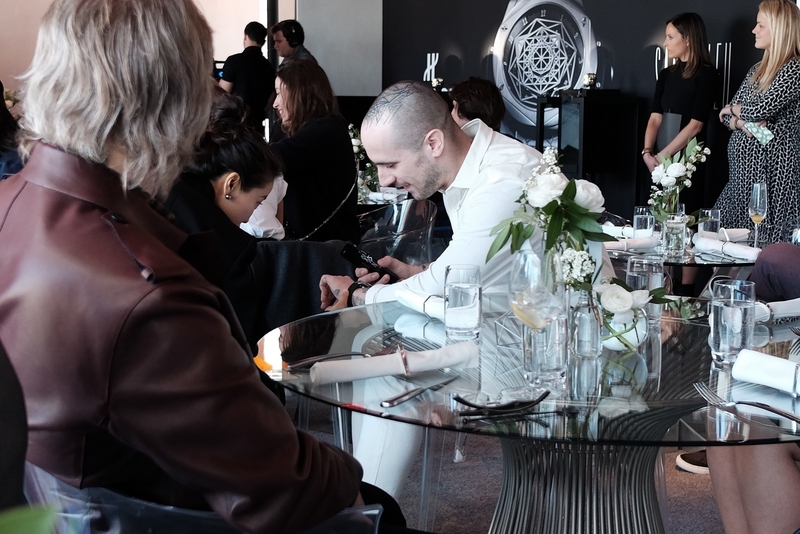 On April 20th, at the Robert, located on top floor of New York City’s Museum of Art & Design – overlooking Central Park and Columbus Circle – Jean-Francois Sberro, Managing Director Hublot of America, and Swiss tattoo artist Maxime Büchi, presented a new limited edition collaboration Hublot timepiece called the Big Bang Sang Bleu. To give a little background, Maxime Buchi founded Sang Bleu magazine in 2006 – merging art, fashion, literature, sociology, and tattooing. Eventually, that led to the formation of Sang Bleu London Tattoo Studio in 2014, which consists of a dozen A-list tattooists. Notably, Buchi’s most famous clients include Kanye West and Adam Lambert. 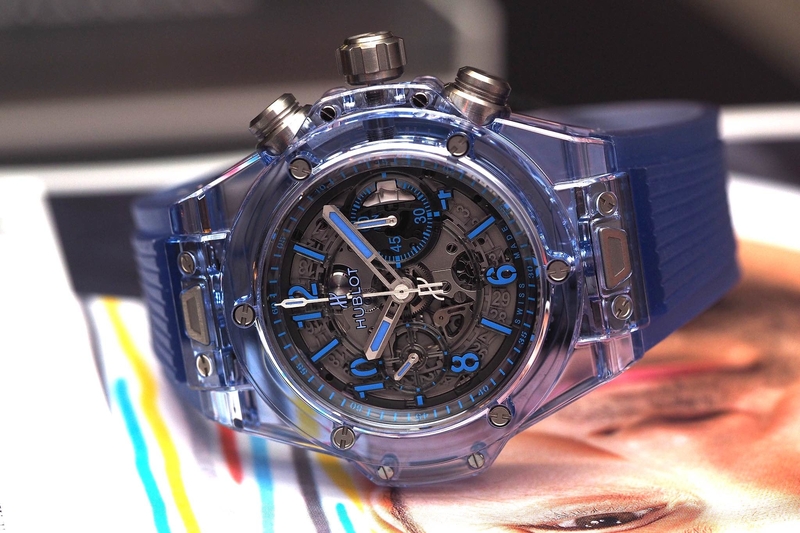 The Big Bang Sang Bleu is presented in a 45 mm titanium case which has a unique engraved geometric motif in the center, drawn by Buchi in the same way he would design a tattoo. The bezel has a hexagonal shape, facetted to match the metal sculpture in the center of the dial. A matte black dial features a black satin-finish circular flange stamped with the hours. Just inside is a ring stamped with the minutes. Interestingly, the numerals created for this piece by were done by Maxime’s typeface-design agency SwissTypefaces SARL. Time is displayed by the three octagonal discs. Hours are indicated by the outmost disc. Minutes are indicated by a disc just inside of the hour disc. And seconds are indicated in the center on a black disc stamped with the H of Hublot and the stylised hourglass of Sang Bleu. Available in a limited edition of 200 pieces, the Sang Bleu is powered by a Unico manufacture movement, which has been entirely re-engineered without a chronograph function in order to display time through three discs. The oscillating weight features what Hublot calls the “triangular codes of the Sang Bleu logo.” Finishing off the piece is the Sang Blue logo engraved on the back of the calfskin/rubber strap. 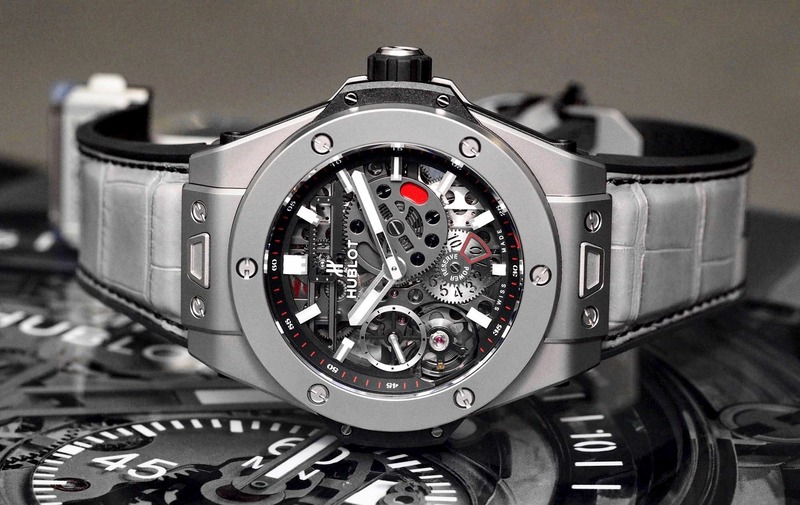 Taking an artist outside of watchmaking and combining their talents with watchmakers to create a unique timepiece is nothing new, but the concept is still very interesting, especially considering that Hublot chose a tattoo artist. And the fact that they redesigned the watch mechanism around the tattoo scultpure in the center, is actually quite innovative. 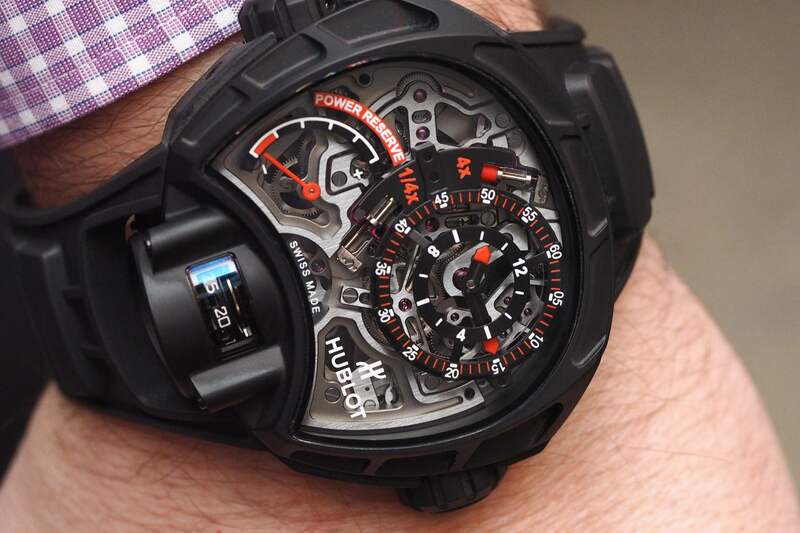 A unique fusion of art and watchmaking, if you will.